My friends know that my local commitments the first half of this year (in a play, and producing a play, plus…) have impinged on my “shunpiking.” In addition, there is always something else. My spine surgery and fusion last year was great, but now the arthritis in my hips is impacting on my mobility. Sadly I cancelled out (losing my deposit) on a fantastic trip to Spain and Morocco — I am afraid to fall on uneven surfaces. Swallowing pride, I often can now be seen with a cane to be safe. Now trying to orchestrate buying a new hip. BUT, I had to get out and explore. heading north on Route 30 you enter Townshend, and if a comedy movie aficionado, you know that the winter carnival scene in Chevy Chases’ FUNNY FARM was filmed on the green here (his home was in my favorite Grafton – I think I know where). 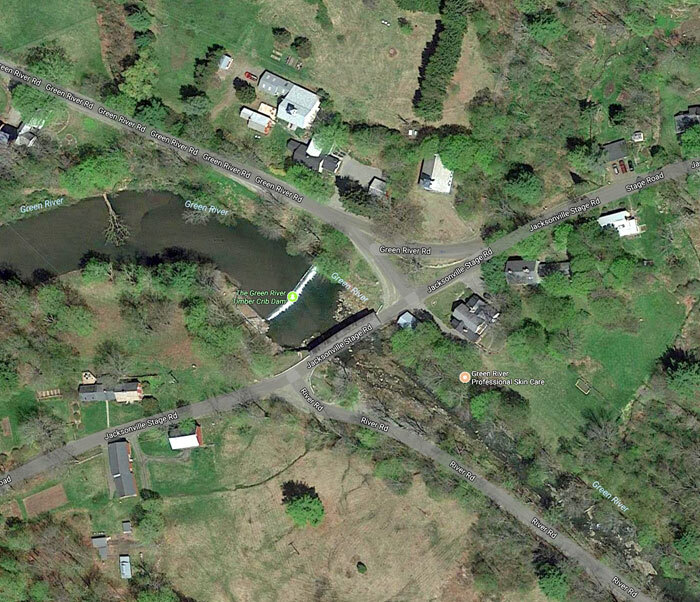 The next bridge was Scott Bridge (1870) just below the Townshend Dam. A combination of three bridges put together, it is no longer open to vehicles. Remember with my galleries that you can click on an image to open large sizes. 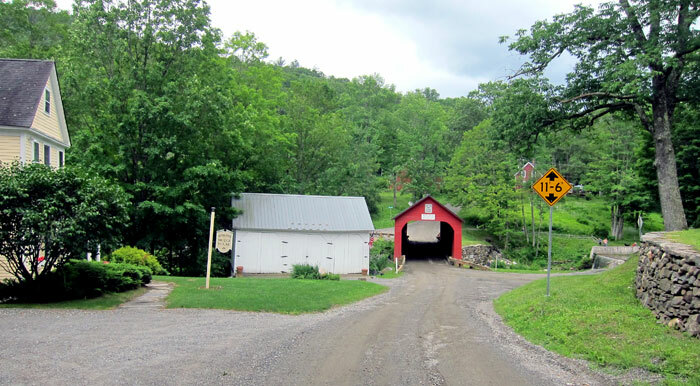 Back south on Route 30 to Newfane, which is idyllic and I recommend you visit. 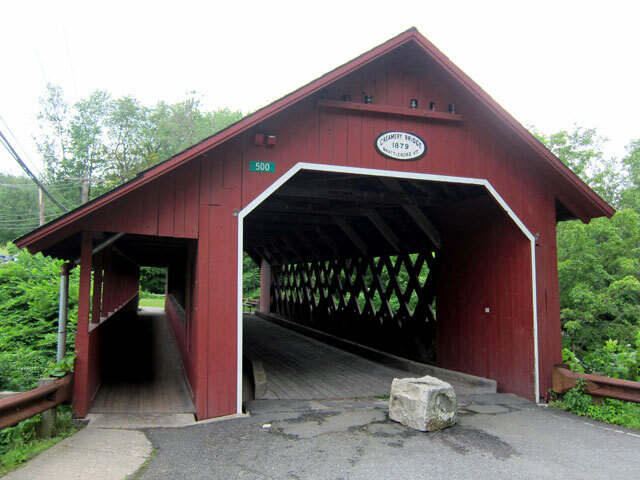 Jogging off Route 30 to the village of Williamsville you find the last of Newfane’s seven covered bridges, originally built in 1870. Of course I stopped at the country store, hoping to see an old antique interior, but it is now an evening eating and entertainment venue. But, you have to (and should) pass through the village. How can you not enjoy this view? 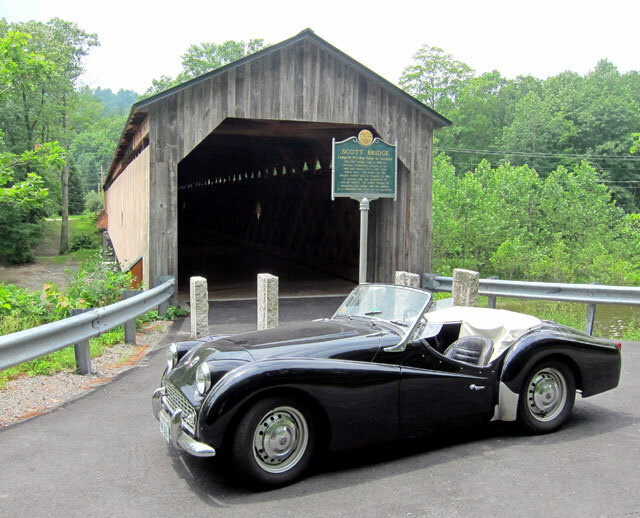 When I parked on the other side a couple from Saugus, MA came up asking, “are you following us, we saw you at Scott Bridge.” “Gee, BLACK BEAUTY sort of sticks out doesn’t she.” I replied. We chatted bridges and Vermont back roads, and exchanged tips. 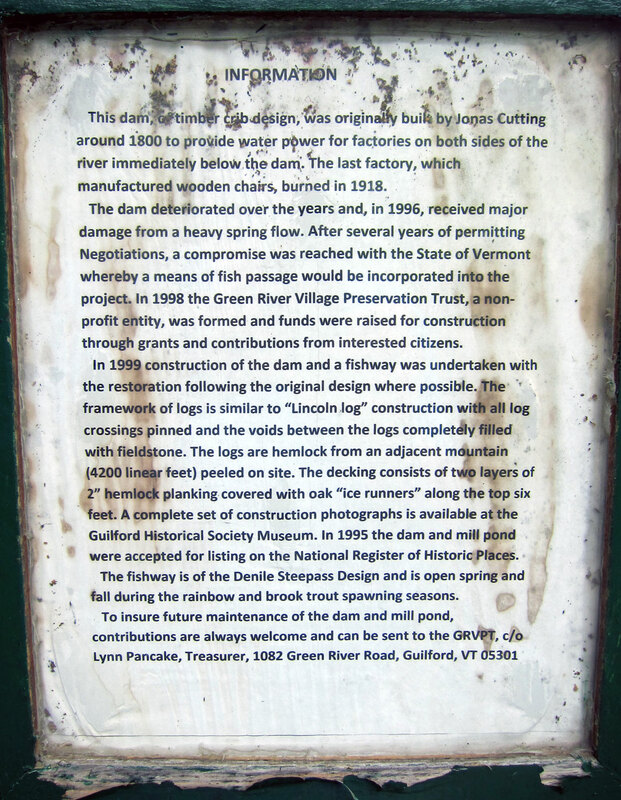 You may wish to open and read these panels for the Bridge’s history and rebuilding in 2010. 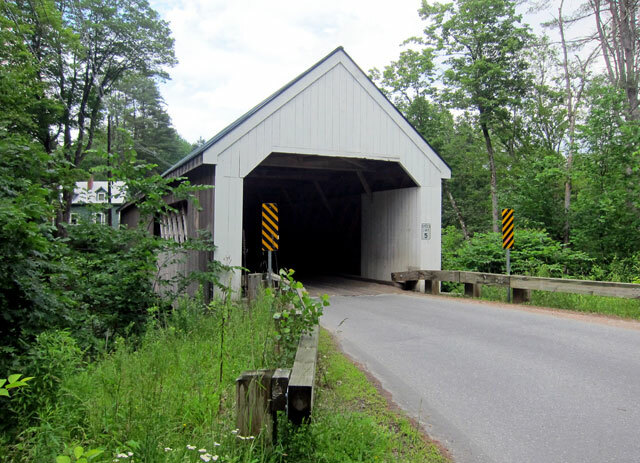 It was evident on this trip that Vermont is carefully preserving and rebuilding their covered bridges carefully maintaining the original appearances. 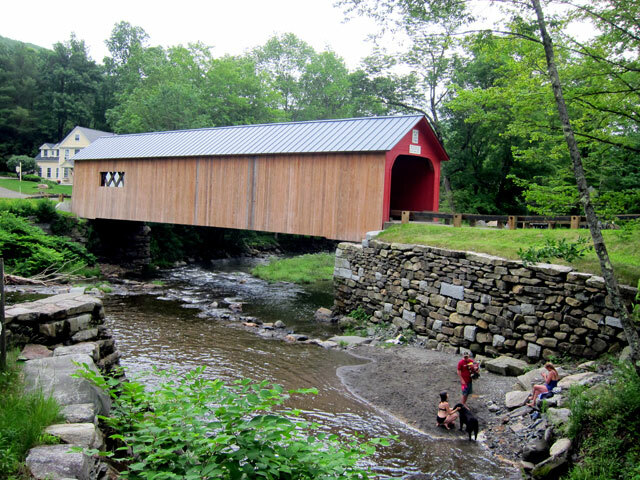 And, then back across the bridge, exploring the dirt roads of Williamsville, hiding under a tree, and back on Route 30 to Brattleboro. to see Creamery Bridge off Route 9 west in Brattleboro. The bridge was closed in 2010 with a new bridge built just to the east. 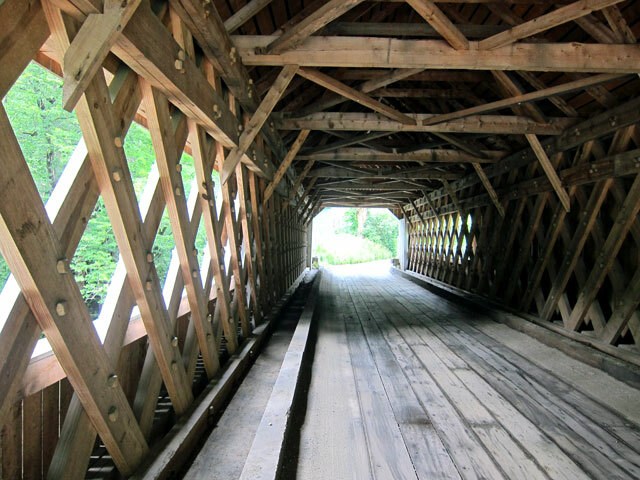 I walked across the bridge, and back on the covered foot bridge built about 1917. This was the most heavily travelled bridge in the state. 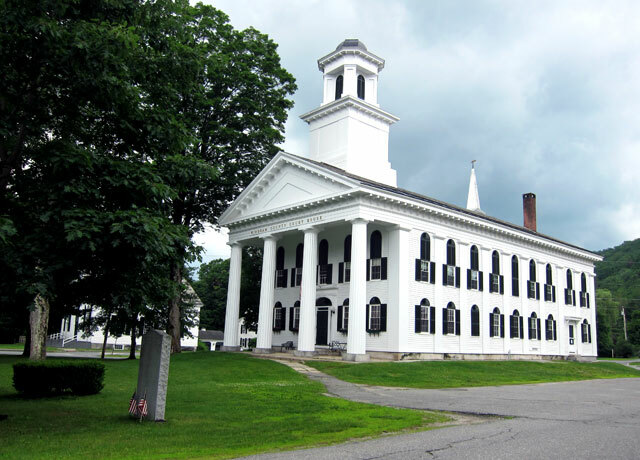 Note it appears that power or telephone lines were strung through the gables. 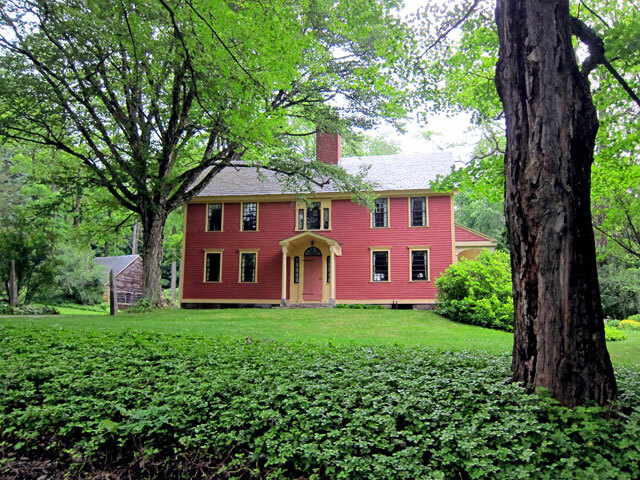 It was then head south on Creamery Road into Guilford — WOW – Guilford needs more exploration. Before I left home I found a Vermont Road Atlas I forgot I had put away in Black Beauty’s boot, and that did not even help to find the village of Green River. Amazingly I got a connection on my phone, and WAZE guided me in (sorry!). I arrived – to the highlight of the day. 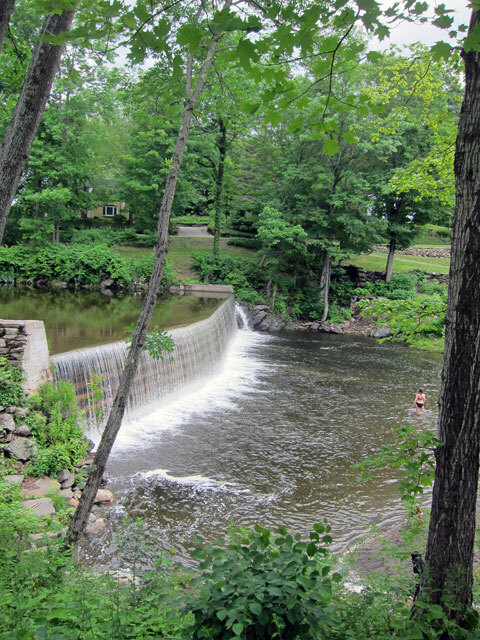 people were enjoying the water below the crib dam – note that recent wood replacement has occurred. As BB1 and I were preparing to leave a lovely lady, Ruth, stopped her bike and we visited sharing philosophies of life, and she sharing various routes I should explore. 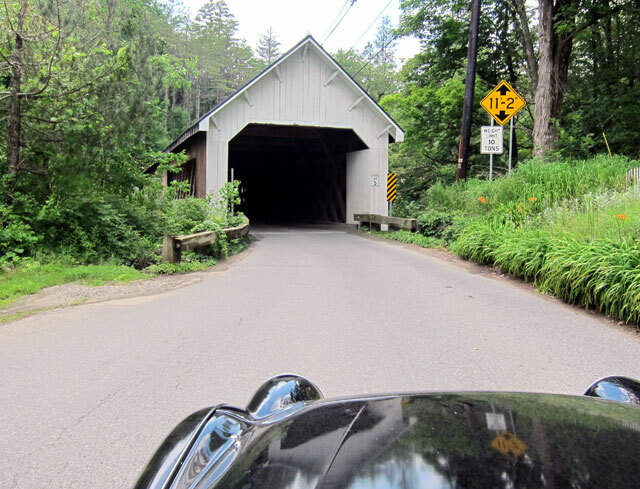 “Head down River Road,” Ruth said, “turn right on Jelly Mill Road, and you will eventually loop back here.” She also told me there are over 100 miles of roads in rural Guilford, and she was surprised that I actually found the bridge the way I came in. I was persistent I said, but did not share I gave into WAZE. I loved the routes she recommended, and do hope she calls sometime so we can have dinner and share more stories. This view (not my drone, sorry) is an aerial of the bridge, village and dam. Back dirt roads abound in Guilford, and you have no idea what you may see around the next bend. Dinner then at The Top of the Hill Grill on US Route 5 in Brattleboro – and I highly recommend the Roasted Root Vegetables. Home – about 6 hours on the road, fun, great conversations with strangers. 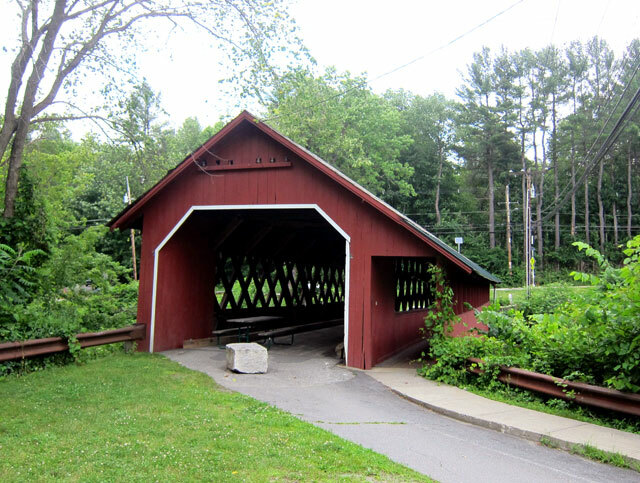 And preparations for today to explore the covered bridges in the Windsor, Vermont area, and hopefully make the concert at St. Gaudens. 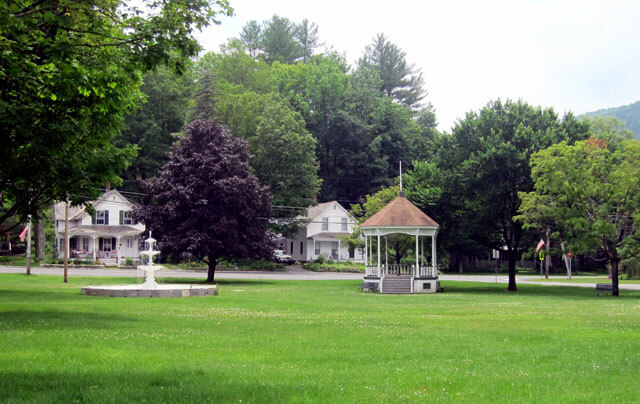 And, I will help Calvin celebrate his birthday in Plymouth Notch on the 4th. 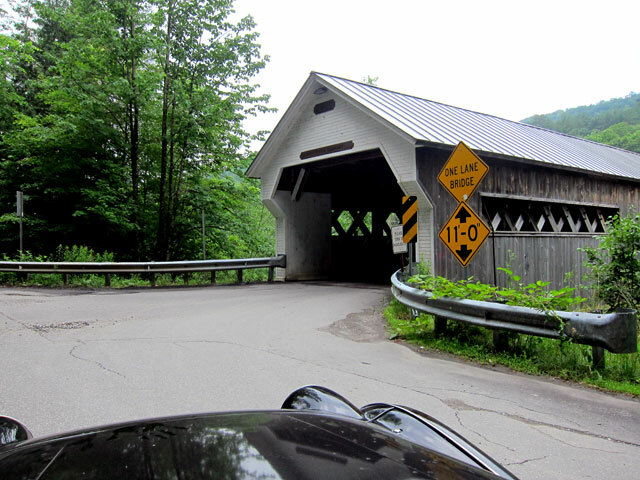 This entry was posted in Day (or maybe two) Trips and tagged Green River Village, Guilford, Vermont, Vermont Covered Bridges. Bookmark the permalink. Interesting as always, Ray! 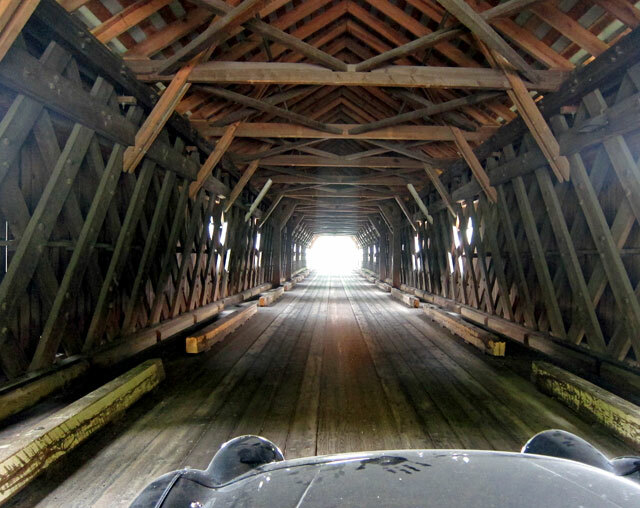 I love the diamond shaped view of the river through the covered bridge window. My brother-in-law’s family own a house on the dirt road on the left of the Eatery in Williamsville. I think it’s called Timmons Hill. I do remember when that building was more of a general store. Then it was closed for many years do to sewage problems. I know my sister has eaten there recently. I hope to try it sometime, too. Hi Ray, Beautiful bridges and Black Beauty beautiful in grand form. All of the bridges were in great shape. Lovely article.